With 3D already going through the latest and greatest HDTVs, the next thing to come is 3D sound. And LG is doing just that. They are coming out with their new 9.1 surround sound system. LG will have four new home theater systems on display this week at CES, but the first one it's showing off is the BH9420PW, which uses "3D Sound Zooming" to match the positioning of sounds with 3D video being displayed on one of LG's TVs. It achieves this thanks to four upright speakers added to the traditional 5.1 layout and algorithm that detects depth of effects being watched in 3D. According to LG, this makes for a wider sweet spot than usual, but we'll have to see if that is true. Below is some cool press pics. The lady though is starting to get annoying. This blog is mainly about tech, so lets keep it that way. But here are the pics anyway. And below is that is a nice press release. SEOUL, Jan. 4, 2012 –- LG Electronics is introducing four new home theater systems at this year's Consumer Electronics Show (CES) equipped with LG's latest 3D sound technology. By combining its 3D Home Theater Systems with the company's popular CINEMA 3D Smart TVs, LG aims to solidify its position as the leader in 3D home entertainment. The synergy between LG's CINEMA 3D Smart TV and CINEMA 3D SOUND HOME THEATER products will be apparent in retail outlets, where they will be displayed paired together. 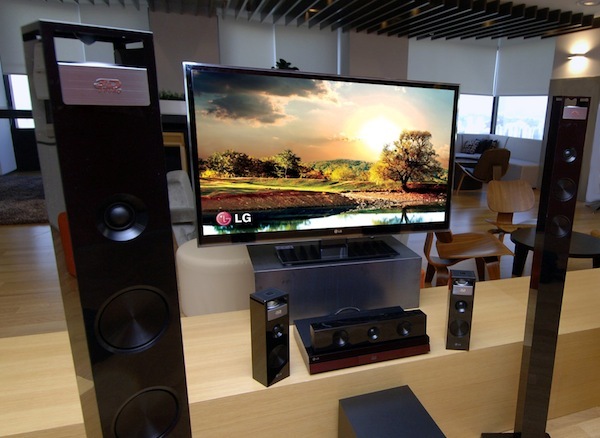 Of the four new 3D SOUND HOME THEATER models scheduled for launch during the first half of 2012, the BH9420PW will be the first to be unveiled at CES 2012. "Whether it's TVs or audio systems, LG continues to offer the most immersive 3D home entertainment experience possible," said Havis Kwon, President and CEO of LG Home Entertainment Company. "Our CINEMA 3D Smart TVs will now be accompanied by a wider variety of CINEMA 3D SOUND HOME THEATER products that offer consumers a complete 3D experience and further strengthen LG's leadership in 3D." The BH9420PW incorporates LG's very own 3D Sound Zooming technology, which constantly synchronizes sound output with the location and movement of the on-screen 3D images on a CINEMA 3D Smart TV. In turn, 3D Sound Zooming plunges the viewer into the middle of the action, as the events that unfold on their 3D TVs immerse and surround the viewers as both images and sound in real 3D. 3D Sound Zooming is capable of generating variety of depth in sound based on a complex algorithm that analyzes the varying depth of numerous on-screen objects displayed on the 3D TV. Such immersive 3D sound quality is enhanced further by the BH9420PW's 9.1 speaker system, which adds four Upright 3D Speakers to the 5.1 channels of a conventional home theater system. The four Upright 3D Speakers pump sound upward, ensuring that the vertical space is completely filled with sound. Meanwhile, a 360º Reflector inside each of the Upright 3D Speakers reflects sound in all directions, creating acoustics as rich as those in a concert hall. Moreover, by applying LG's unique 3D effect DSP algorithm, the Sound Field Expansion technology further expands the horizontal sound field, and works in harmony with the Upright 3D Speakers to create a truly immersive, 360º sound experience. Additionally, the audio "sweet spot" is further extended so viewers always feel as if they are right in the middle of the action, regardless of their location in a living room. In order to provide viewers with a wide range of 3D experiences, the BH9420PW is equipped with a Smart TV function. In turn, any ordinary 3D TV can have access to LG's Smart TV ecosystem, which is composed of a growing variety and quantity of 3D content through various premium content services and apps, such as LG's 3D Zone. The BH9420PW will hit stores in March 2012.